After 4 years of hiatus, Fall Out Boy are back, rewarding fans who have hung on for any tidbit of information and kept hoping for a reunion. 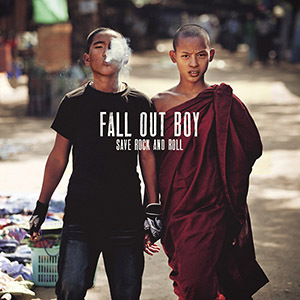 Their album, Save Rock And Roll, was released on the 15th April in the UK, with those who had pre-ordered, receiving a range of merchandise, depending on when they chose to order the CD. For a long-time fan, this album was a treat, but there was some anxiousness - would it deliver, were the band taking a truly new direction, was this 'the divorce album'? The album does seem to be appealing to a more mainstream audience, with an almost hip-hop edge to their rock 'n' roll songs. They've combined the techno sound Patrick Stump began working on with his solo project during the hiatus, with the rock, 'pop punk' music Fall Out Boy were known for before their break. Pete Wentz's sometimes confusing yet emotional lyricism has endured, as has the anthem quality of Fall Out Boy's work. I was pleased to notice the orchestral elements of Folie A Deux were still included in these new songs, and the hooks and riffs that make this band's songs memorable and catchy. Save Rock And Roll might take a few listens to get in to, but soon enough tracks like 'Young Volcanoes' and 'The Phoenix' are in your head, and are the kind of songs you want to turn up as you enjoy the sunshine this summer. Their return to the UK at the Reading and Leeds festivals is likely to be explosive, and a chance for fans to reminisce with old catchy classics, and these new fresh anthems. Check Fall Out Boy's website for more information and updates on the band.